Test your nerve by journeying through a mountain via a series of exciting adventurous challenges on one of our three epic underground adventures. 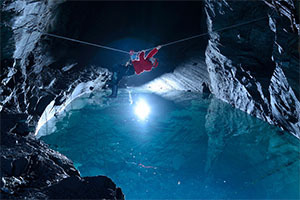 Try your hand at zip-lining through caverns, or climbing up a vertical shaft, boating across a lake, traverse over an abyss, scale a waterfall or abseil your way down to the deepest point in the UK! It’s Adrenaline pumping, heart thumping, pulse jumping fun, guided by the most fun, experienced and qualified instructors in the UK!